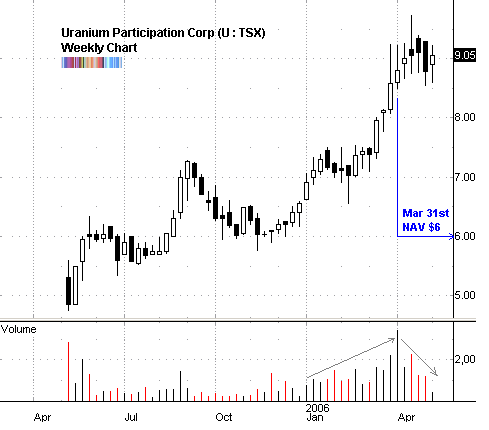 Uranium Participation Corporation is an investment holding company created to invest substantially all of its assets in uranium, either in the form of uranium oxide in concentrates (”U3O8“) or uranium hexafluoride (”UF6“), with the primary investment objective of achieving appreciation in the value of its uranium holdings. 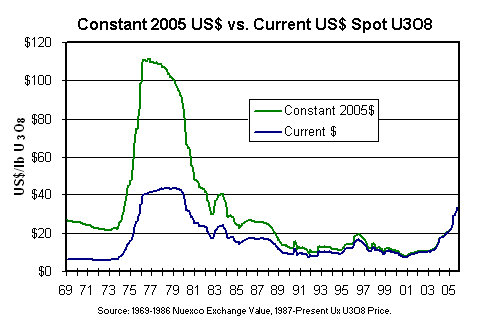 The objective of the Corporation is to provide an investment alternative for investors interested in holding uranium. But I would think twice before buying it here because it is trading at a whopping 50% premium to NAV (latest NAV released by the company was for March 31st at $6). Granted, since its IPO, U has always traded at a premium. Probably because it is the only way to invest in the commodity itself. But a 50% premium is ridiculous. I would patiently watch for an orderly pullback (with low volume) and allow for a more palatable entry. this is the least reported bull move! yeah, its surprising just how much under the radar uranium is. Maybe I’ll write a follow up.